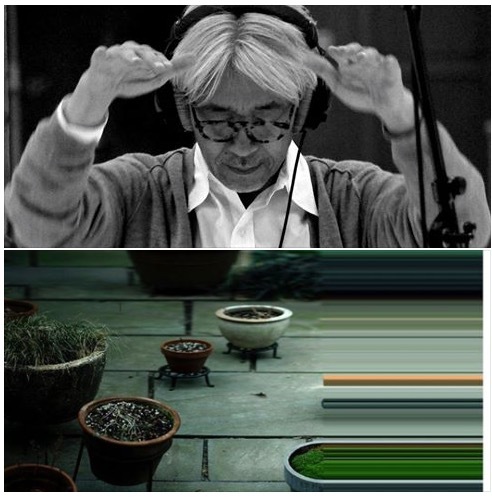 Ryuichi Sakamoto has scored the innate soundtrack of earth and civilization into a symphony of the senses. After facing death head-on with cancer, the brilliant composer began a new and sacred relationship with natural and incidental sounds, and with his favorite synthesizer. This spawned async – his first new album in eight years at age 65. The anticipation of Sakamoto’s performance was heightened, wondering how he would interpret his unusual new album live. Let me try to recreate these sounds in my head using my analog synth as soon as I wake up every morning. Let me take Bach’s choral and arrange it as if it were in fog – to reveal an austere logic inside of a formless cloud. Let me try making music whose parts and sounds all have different tempos. This was the coolest album preview ever (async will be released on 4/28). A piano, analog synths, a guitar, vibratory implements… A performance of ‘songs’ devoid of melody or tempo – out of synch. Is it music? YES! And it is strangely – almost impossibly – harmonious. The concert was a hallowed experience in an intimate historic venue holding only 100 people. The late 19th century room was very dimly lit. When the beautifully distinguished white-haired composer entered, the lights were diminished further. Sakamoto began at the piano, accompanying his new album’s sounds. He played the piano traditionally, and also by plucking and tapping its strings. A screen on the ceiling above the piano displayed beautiful scanning and flickering moving scenes of nature – clouds, trees, the moon, the ocean, water drops, sleeping people and animals. Through the sounds we could hear the scenery and conjure memories. Sakamoto’s Zen-like performance induced peacefulness and calm, as we have all heard these sounds throughout our lives – in other times and places. We found comfort here – in miniscule noises synthesized and amplified just above a whisper, in oscillating drones and vibrations. All were familiar; objects, instruments, movement, yet their identities were clouded or enshrouded. We were pleasantly haunted by these beloved dreamlike sound-ghosts. The small audience remained completely silent through the performance, apart from the reverent welcoming and closing applause. Sakamoto stood, tapping/scraping a large upright sheet of glass with padded mallets of various sizes, resonating subtle vibrations. The transparency at once mirrored him and allowed us to see and hear him through the looking glass, into another realm of sound. However, what we were actually hearing were mutated sounds from our own floating world. It was a feeling reminiscent of Nico and her harmonium, taking us to other sacred places and times. I could not stop thinking how much Yoko Ono would love this. Some sounds recall Yoko’s album Fly (1971) with its man-made robotic instruments replicating sounds of nature. Tarkovsky once said, “Juxtaposing a person with an environment that is boundless, collating him with a countless number of people passing by close to him and far away, relating a person to the whole world, that is the meaning of cinema.”Sakamoto achieves the same cinematic sensation with async. “99% of the music in this world is in synch, or strives to be. It’s human nature. We have a tendency to synchronize. We fall into line without even realizing it. It seems we are actually creatures who find pleasure in being in synch. That’s why we want to create untraditional music that doesn’t synchronize…like speaking in a language that doesn’t exist.